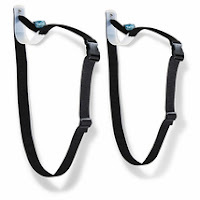 Kayak Straps Rack. 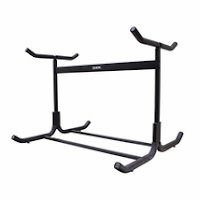 This rack comes in at a really affordable price ($49.99) and also is a really practical rack. A little bit different than you might think of in a traditional "hard" rack, this wall mount straps rack allows you to keep the straps open while you slip your kayak into them, then tighten them up so your kayak fits safely and snugly. Check out the video demonstration. 3 Kayak Wood Wall Rack. 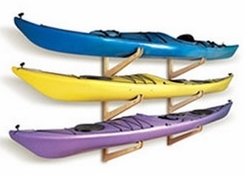 This wooden wall rack is definitely the more traditional kayak wall rack. It has room for three kayaks on the narrow end of the spectrum (see details on our site). But the wood gives the rack good strength and each kayak can weigh up to 100 pounds. More details on the video demo. Free Standing 3 Kayak Rack. I will call this our most tricked out kayak rack because there are lots of great features and even more can be added. This rack is a free standing kayak rack that holds 3 kayaks and is made out of steel and so is super heavy duty, making it the perfect rack for shop owners or serious kayak enthusiasts. Have even more kayaks? You can purchase the expansion add-on to give this rack the capacity to hold 5 kayaks. Paddle Rack. When you have a bunch of kayaks, you're also going to need somewhere to store your paddles! And I'm not talking about the corner of your garage or shed. Check out this paddle rack.